Lets Dance at Lucky’s Guys! Its all for a good cause! For Gili Air! Its official, every party organised, Lucky’s Bar has agreed to donate to the Soraya Foundation. Which officially makes them the first regular sponsor of the Soraya Foundation! We couldn’t be happier! It warms our heart to have a regular local sponsor from the island. Gili Air, we love you. Thank you for your support Lucky’s Bar! What to we want to do? Participants at the 8th Annual Biorock Workshop collecting coral fragments from a damaged coral reef, Gili Trawangan, Lombok, Indonesia. The coral fragments are immediately transplanted to a new Biorock structure. Also most welcome to pitch us your ideas, we’ll be happy to make them reality if its what we believe in. If these are causes you believe in. Sponsor us! Donate! Dance at Lucky’s! Organise a fundraising event in your home or business. Because we care and we’ll make a difference. Lets change the world together, one island at a time. Its just over a year ago that we started the Soraya Foundation. Valentina, my partner, shared with me her dream. Her dream was to start a Montessori Playground for her daughter, Soraya. Wanting kids of my own one day, I thought it was a brilliant idea and told her, I’d support her fully. When I consulted my consultant in Lombok to know what type of paperwork we needed to create a Montessori inspired playground, she told me I needed to start a foundation. You know that feeling you sometimes get? When you feel like you are exactly where you are supposed to be? I felt this light, flowing through my body. Because I always had this little voice in my head telling me. What better then education? One school to support the other. It just felt like destiny. We started in August 2017 with community classes, first English, then Music Anglung classes, we raised money to buy a plastic free paradise kit for all the kids with Gili shark Conservation and since this year we offer social circus classes, part of our earthquake relief program, after Lombok and the Gili islands got hit by several earthquakes. The kids simply love it. It so nurturing to be able to make them smile after what they’ve been through. There is no better way then to do trauma healing then circus workshops. Great for coordination, creativity, discipline, physical education,… Plus, it will most certainly be a good baggage for their future. English is clearly useful, as most of them will work in tourism. Music education can help spark a child’s imagination or ignite a lifetime of passion. We thought, why stop here? Lets get involved and improve waste and water management, lets regenerate the coral reefs, in partnership with Gili Eco Trust and add some Bio Rock Reef Restauration to Gili Air. We have plenty of good ideas, now all we need is funding. Who wants to sponsor our dreams? We’ve also started with micro finance. We call it sponsor a dream. The locals bring us a project and we coach them into making it a successful reality. Inspired yet? 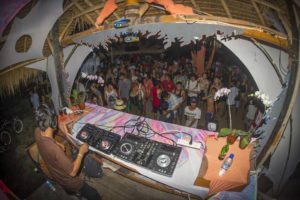 We create Magic for Gili Air. That’s what we do. If you want to sponsor us. Thanks to all of you, we can help all of them. Namaste.